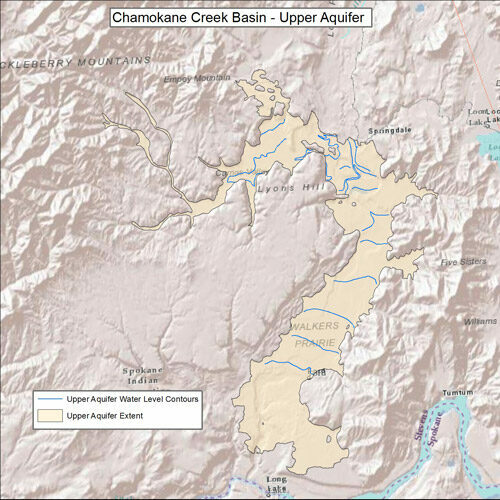 The Upper outwash aquifer of the Chamokane Creek basin is an unconfined aquifer consisting of sand, gravel, cobbles, and boulders, with minor silt and (or) clay interbeds. Previously described geologic units that comprise the bulk of this aquifer include glaciofluvial deposits (outwash), glacial outburst flood deposits, and alluvial deposits. 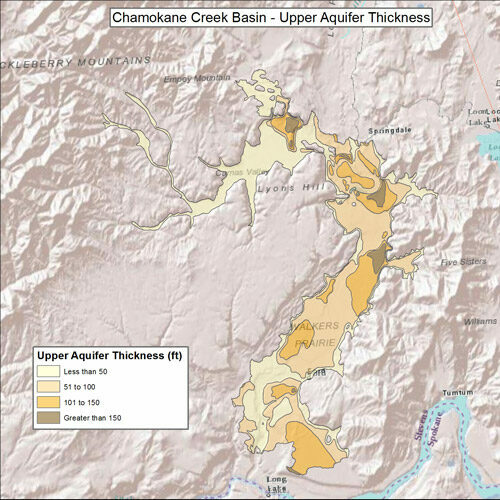 Although the Upper outwash aquifer exists over much of the valley floors, some places within the aquifer are not sufficiently saturated to yield sustainable quantities of water to wells. Wells are drilled into deeper units in these areas. Thre data sets are available, 1.the upper aquifer extent, 2. upper aquifer thickness, and 3. upper aquifer water level contours. Data sets are from USGS Scientific Investigations Report 2010-5165.